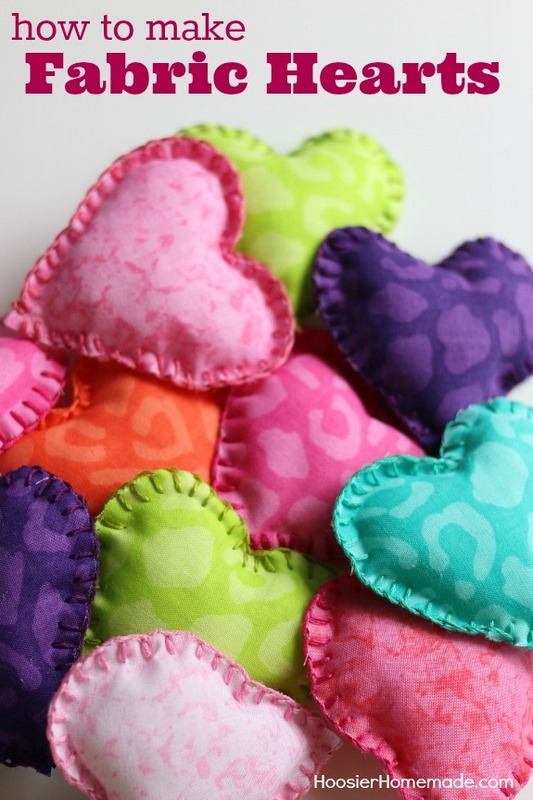 The options are endless for these adorable fabric hearts – perfect for Valentine’s Day crafts, decorating or to add to a gift. 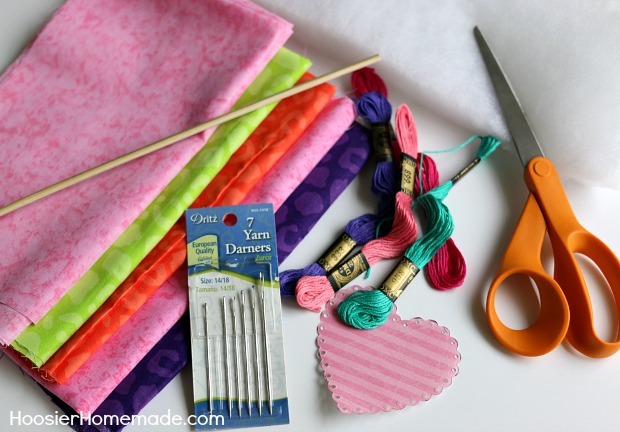 Let me show you how to make fabric hearts! They are super easy and lots of fun! You won’t need any special tools and the kids can even help stuff them! I have been a long time lover of fabric. Some (my husband, Doug) may even call me a fabric hoarder. I used to sew many of the clothes that the boys wore, and even created matching outfits for the holidays several times. It’s been many years since I did that, but my love for creating, especially crafts, with fabric still lives on. 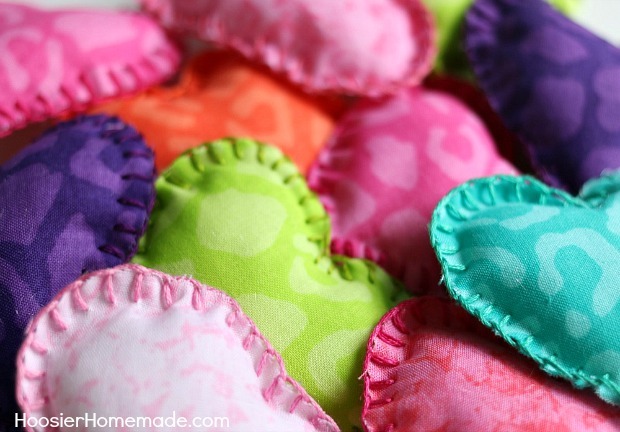 These fabric hearts were so fun to make! I did all the cutting, then sewed and stuffed them while watching TV one evening. After the fabric hearts were all done, we added wooden skewers to them and displayed them on the Valentine’s Day Mantel. I love how they look on the Mantel, but really, I love them just in a big pile too! First, you will need some supplies. There are only a few, and some you may already have at home. Fabric – we chose bright colors and used 2 packs, one has different shades of pink and the other has bright colors- there is a great selection online now! Lay fabric right sides together and trace around pattern with a pen or pencil. Cut out heart. Make another stitch directly on top of the first hole and pull through ALMOST completely, leave a small loop and put the needle through the loop. Pull firmly but not tight. This is your first stitch and it creates the base for the blanket stitch. Begin the blanket stitch by putting the needle in through both layers. The distance and length of stitch is totally up to you. I like the stitches to be as uniform as possible, so I keep the length the same and the distance about 1/8 inch or less apart. Create a loop and put your needle through the loop to create the stitch. Continue around the edge of the heart. To make the point smooth and not pucker, create 3 stitches – 1 stitch at an angle, the next stitch directly in the center and the third stitch at an angle. Continue around the second edge of the heart leaving about 1 inch open. Leave the thread on the needle and attached to the heart. Stuff the heart with batting using the skewer or other tool. 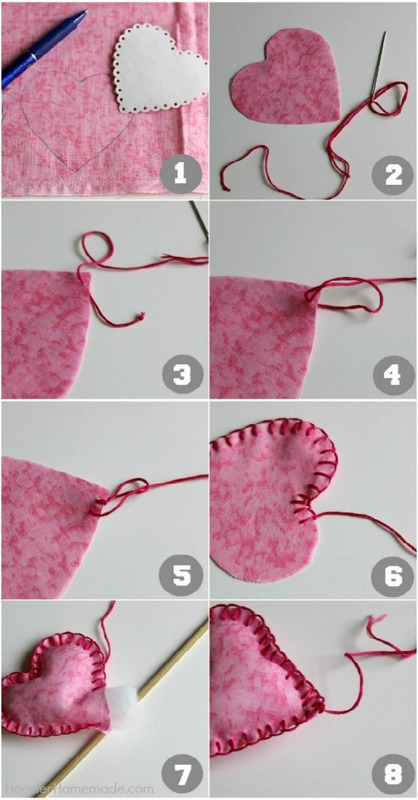 Close up the heart by continuing with the blanket stitch until you reach the point and tie off the floss. When you have all the hearts made, the options are endless for decorating or giving as gifts. 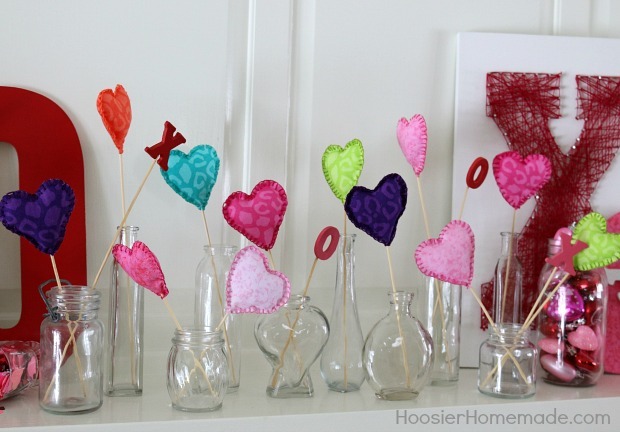 For our Valentine’s Day Mantel, we added a wooden skewer to the heart and displayed them in clear glass containers. You could also add a string and hang your hearts on a string or add them to a gift. Here’s a sneak peek at our Valentine’s Day Mantel. Watch for more details on Wednesday. Cute and colorful! And easy too. Great job! These hearts are so cute! 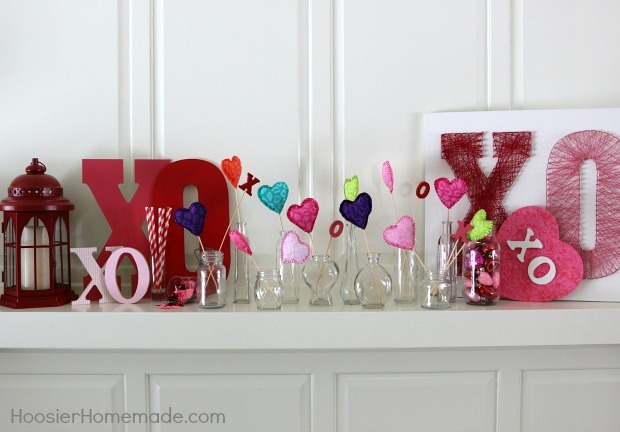 I love decorating with hearts – even when its not Valentines Day. Thanks for sharing how to make these – pinned. I too have a lot of fabric since I sew a lot – I also have a lot of yarn since I knit and crochet, too. Those are adorable, I just love the colours and how you displayed them. These are adorable! Lovin the mantle, especially that xo string art! Thanks for linking up to Merry Monday! Sharing on Twitter! Have a great week! How cute! what a great way to use up some scraps! Love the colours, these are very sweet! I love them! Great colors too! 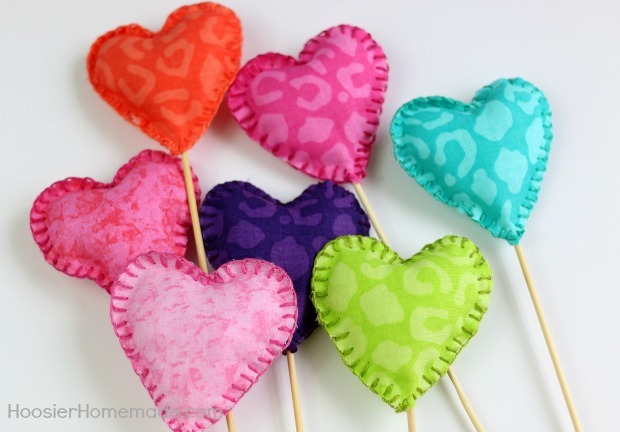 I’ve made felt hearts before, but now I need to try to make them with fabric too. If you have time, I would love for you to come and share this post over at the Really Crafty link party that is live right now! (http://keepingitrreal.blogspot.com.es/2016/02/the-really-crafty-link-party-4-is-live.html).